The United States of America is not bordering with Skopje, but Greece is", the Greek Foreign Minister Dora Bakoyannis said as commenting the recent support voiced by US to Macedonia. 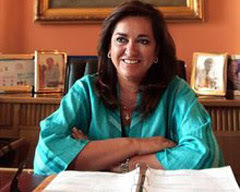 "We are neighbors and it is of Skopje's interest to solve this issue together with us", Dora Bakoyannis said in a statement given in Belgrade, relating the letter of the US State Secretary Condoleezza Rice to the Macedonian Foreign Minister Antonio Miloshoski, expressing support to the Macedonia's constitutional name and membership in NATO. "Everyone has the inalienable right to reiterate their positions and articulate their hopes", Bakoyannis said. "Beyond that, Greece’s friends and partners have been made aware of our well-known, firm positions".